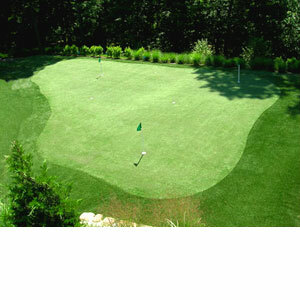 Nylon turf is our most popular surface for outdoor and indoor putting greens due to its easy maintenance and durability. Nylon turfs do not require any sand fill and are virtually maintenance free. Call our Toll Free number to talk with our experienced information and sales staff. They can answer all of your questions, plus in addition, you can order our FREE sample turfs today!! Samples will be shipped out to you immediately.